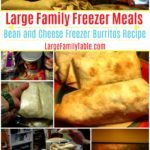 Freezer Burritos are another quick and easy large family freezer meal to have made ahead and stashed in your freezer. We made over 80 of this easy burrito recipe a few weeks back when we were preparing a bunch of easy freezer meals. Don’t be scared of frozen burritos. They are easy to reheat from frozen and simple enough to make them a kid-friendly meal. With this burrito recipe I don’t even add any spices. That’s how quick and easy this recipe for freezer burritos can be made. The refried beans and shredded cheese do the job. Simply add some sour cream or other favorite burrito toppings when serving. 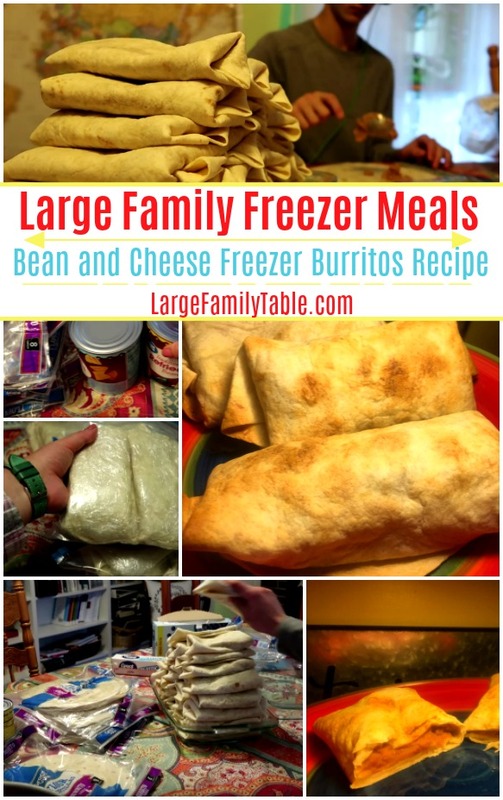 Make 80 or so Bean and Cheese Freezer Burritos with this large family freezer meal recipe! These reheat perfectly in the oven or microwave. Get a big batch in the freezer today. Stir together five 29 oz cans of refried beans. Spread 3 spoonfuls of beans inside burrito wrapper. Sprinkle shedded cheese on top of refried beans. Wrap burritos and stack on platter. Once all burritos are completed wrap each one in plastic wrap. Fill labeled and dated gallon freezer bags with wrapped bean and cheese freezer burritos. Place in freezer for 3-6 months. Click here to watch us make over 80 Bean and Cheese Freezer Burritos in this new video! Bean and Cheese Burritos reheat well directly from frozen. Remove from gallon freezer bag and remove individual plastic wrap from desired number of burritos. Spray baking pan with non-stick spray and place freezer burritos on baking pan. Place in preheated oven at 380 degrees for 30 minutes. Flip the freezer burritos around the half-way mark. To microwave frozen burrito place unwrapped frozen burrito on microwave safe plate. Microwave for 1 1/2 minutes. Carefully flip burrito and microwave another 1 1/2 minutes. Microwave temps and times may vary.